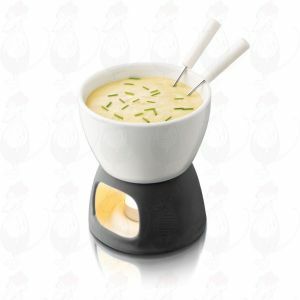 Cheese fondue is the ultimate winter dish. Together around the cheese fondue set enjoying warm cheese on a cold day, it's the perfect meal to prepare on weekends. A cheese fondue set consists of the pot, forks for dipping and, the base where you can either put a small candle or a small burner. 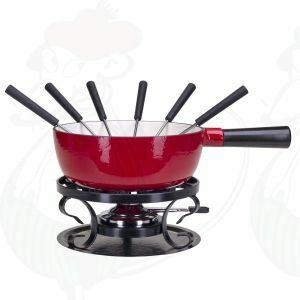 It is heat-resistant in order to keep the cheese warm without letting it burn. 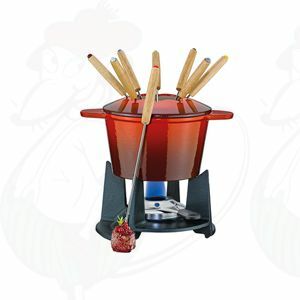 The only thing left to do is to gather around and start dipping! 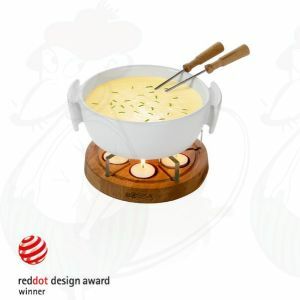 A beautiful slick cheese fondue pan for delicious cheese fondue. 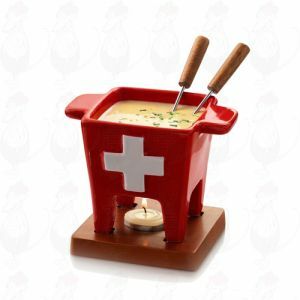 A pretty Swiss cheese fondue for 2 persons or delicious as side dish. A genuine Swiss cheese fondue can only be created using a real cheese fondue set. 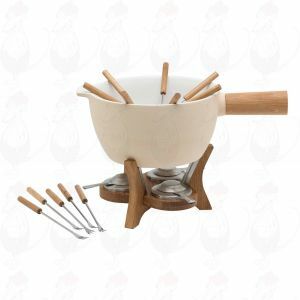 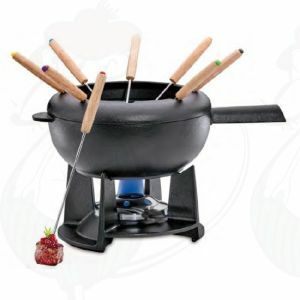 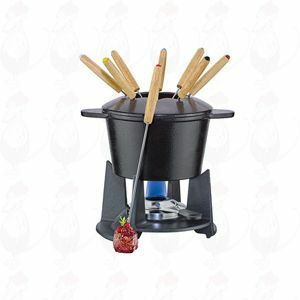 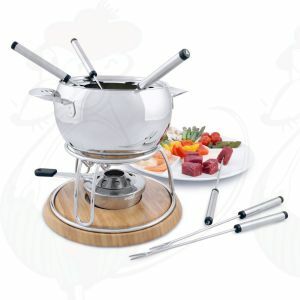 These fondue sets have been specially developed to serve the best cheese fondue. 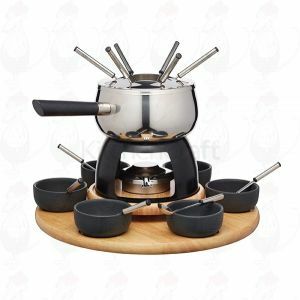 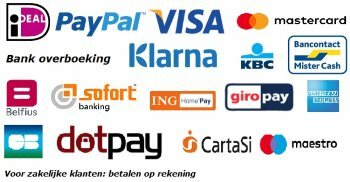 Fully equipped, giving you the choice in different sizes and various materials. 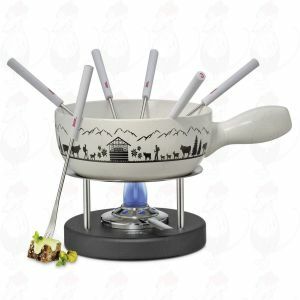 Each set comes with a rechaud with a matching burner and fondue forks. Everything you need to prepare an exquisite cheese fondue for your guests. 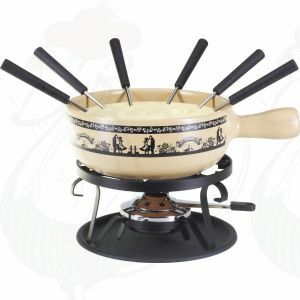 You provide the various cheeses and bread, vegetables and meat to dip into the cheese and enjoy the cheese fondue together during a good conversation and a nice glass of wine. Because the design can set the mood as well, there is a wide and varied range of cheese fondue sets available at our website. 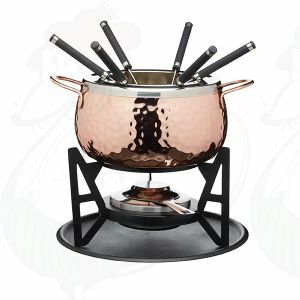 You can choose a cheese fondue set that sets the mood you want to create with your cheese fondue. 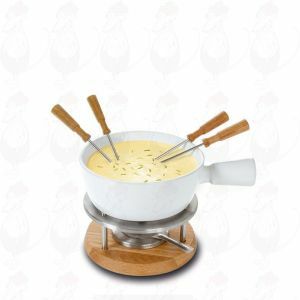 Whether you opt for a classic design or a modern look, the cheese fondue sets are of high quality and are ideal for creating various types of cheese fondue. 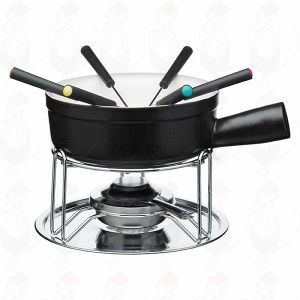 With the use of durable and authentic materials you are assured that you will always have a pleasant and warm setting at the table.